You are here: Home / Eating / Grilled Potatoes in Foil with BACON! 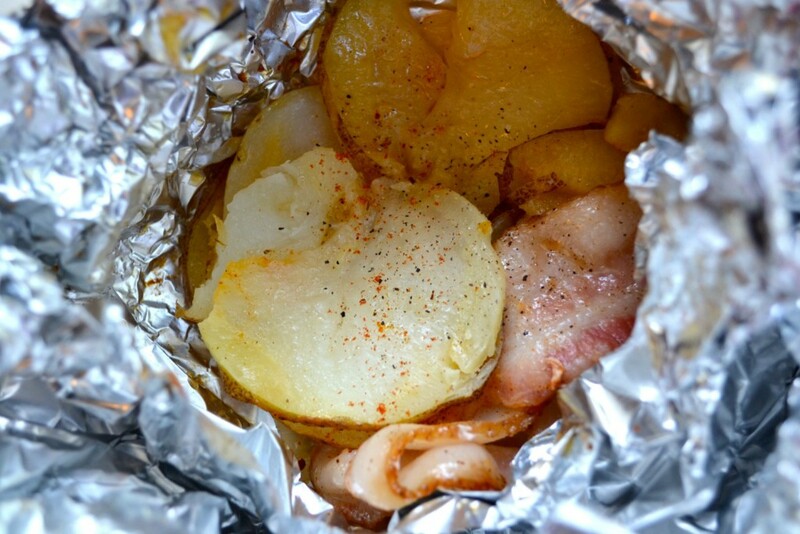 Grilled Potatoes in Foil with BACON! These grilled potatoes are the perfect side dish to make during BBQ season. 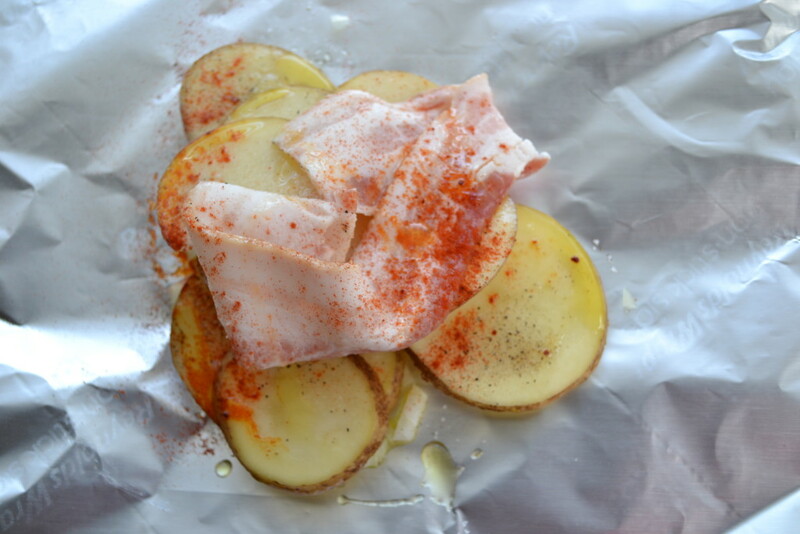 Read below to find out how to make delicious and flavorful potatoes on the grill using foil packets. From the first day of grilling season to the last (and it’s quite a long season here in Houston), my family eats these grilled potatoes as a side dish at least once a week. They are SO quick and simple to make, they go perfectly with any sort of BBQ meat or fish, and they are flat-out delicious. As a bonus, cooking them on the grill in foil means no pots or pans to wash! The onion and the bacon infuse the potatoes with a ton of flavor. If you’re cooking for a vegan or vegetarian, you can substitute smoked paprika for the bacon, and you’ll still get that fantastic smokiness that makes these potatoes so good. 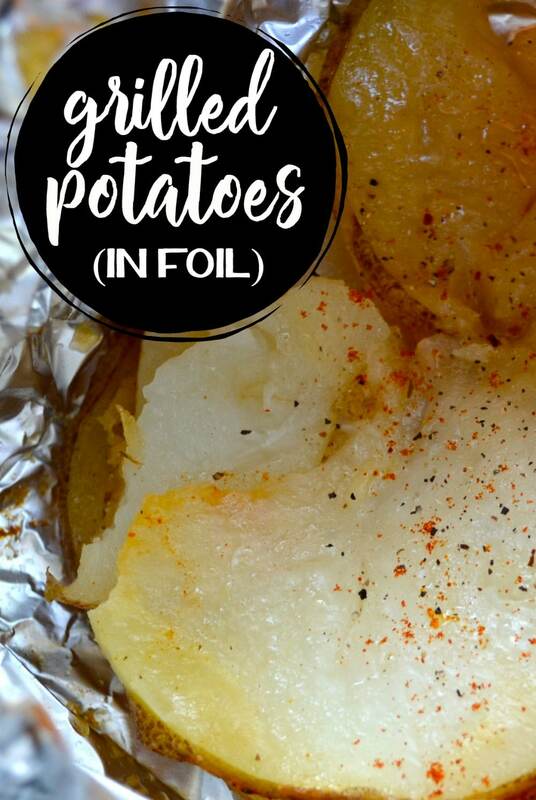 To create the foil packets, use two 15″ sheets of aluminum foil (doubled-up) for each serving of potatoes you will be making. I prefer using nonstick foil, but if you don’t have nonstick foil, make sure to use a generous amount of olive oil to keep the potatoes from sticking. Drizzle olive oil in the middle of the foil. Thinly slice some onion and put it on top of the olive oil. Slice russet potatoes into approximately 1/4″ slices and place them on top of the onion. I use about half of one large russet potato in each packet, and I don’t bother peeling them. Aim for uniform slices so that they cook evenly. Season the potatoes with salt and pepper (and smoked paprika*), and top them with a slice of uncooked bacon. Pinch the sides of the foil together to create a packet. Make sure it’s sealed at the top so that the steam doesn’t escape. Toss the packets on on the grill over medium heat and grill for about 15-20 minutes. You can open the packets a little and poke the potatoes with a fork to test for doneness. 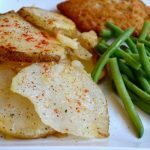 The onion and bacon infuse the potatoes with flavor and moisture, and the steam created in the packet makes them fall-apart tender. Cooking Note #1: The bacon will not be fully cooked when the potatoes are done, so I don’t suggest eating it unless you cook it some more on its own. If you’re not an onion lover you don’t need to eat the onions after the potatoes are cooked, but I still recommend including them in the packets because they add moisture as well as flavor. Cooking Note #2: Smoked paprika is totally optional, but I’m in love with it, so I use it whenever I can. If you don’t have any, don’t worry…the potatoes will still be delicious without it. The most delicious method for cooking potatoes on the grill! Slice each potato into approximately 1/4" slices. Tear off eight sheets of nonstick foil to create four packets (you'll want to double them up, so place two on top of each other). In the center of each foil square, drizzle some olive oil. Divide the onion and place on top of the olive oil. Divide the potato and place on top of the onion. 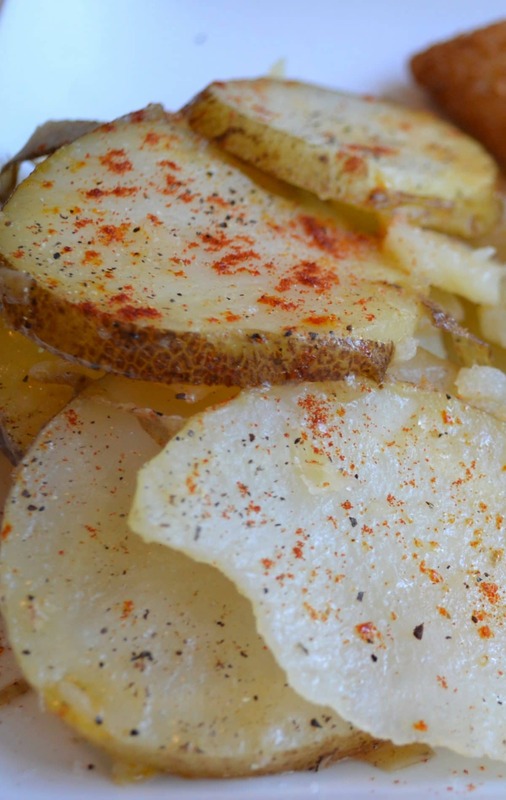 Sprinkle the potatoes with salt, pepper and smoked paprika. Drizzle some more olive oil over the potatoes, and top with a slice of uncooked bacon. Bring up the sides of the packet and pinch closed at the top. Grill over medium heat for approximately 15-20 minutes, or until potatoes are tender. If you want to omit the bacon to make this a vegan recipe, just add additional smoked paprika before sealing the packets. Don’t leave without checking out my Recipe Index for more good and simple recipes. Such a easy and good side dish :) Yummy! These look and sound absolutely amazing. I love grilled potatoes as a side dish, they always go down a treat! Thanks Bintu! We never get tired of eating these.